Individualized artificial voices are being readied for patients scheduled to lose their vocal chords due to cancer surgery. The technique will replace the mechanical, artificial voice converter that is used today. Researchers from the University of Sheffield, with collaboration of a team from the University of Edinburgh recorded the voice of a female patient prior to surgery. The team created a digitized voice based on about seven minutes of speech from the client. "I was a Nursing Sister before losing my voice and have always been aware of how difficult patients find the Servox machine, some refusing to use it and so becoming very reclusive. To have a new technique that sounds more like a human voice, indeed more like the patient's own voice prior to operation, would be a great breakthrough and welcomed by all of us who rely on technology to communicate. "We all take our voices for granted, but it is not until we lose them that we realise what a marvellous gift the voice is. So I thank the researchers on behalf of myself and all who will benefit from this new appliance, for all the work they have undertaken." In expressing her preference for a more individualized artificial voice, Ms. Chapman disparaged the existing technology, the Servox machine or artificial larynx. 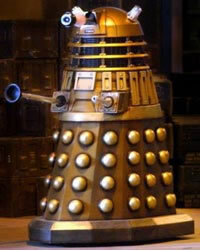 She stated that the "machine tends to sound very like a dalek and can be very embarrassing to use, especially in public places." Science fiction writers have played with the idea of artificial voices and voice technology. Consider the multiple sample voice from The Shining One (1937) by Nat Schachner, the robot voice from Catch That Rabbit (1944) by Isaac Asimov, and even the voice-changing bowtie from Case Closed 1994 by Gosho Aoyama. From this University of Sheffield press release via medGadget.